Zelda Sayre Fitzgerald, born Zelda Sayre in Montgomery, Alabama, was an American novelist and the wife of writer F. Scott Fitzgerald. She was an icon of the 1920s�dubbed by her husband "the first American Flapper." After the success of his first novel, This Side of Paradise (1920), the Fitzgeralds became celebrities. The newspapers of New York saw them as embodiments of the Jazz Age and the Roaring Twenties: young, seemingly wealthy, beautiful, and energetic. In 1936, Zelda entered the Highland Mental Hospital in Asheville, North Carolina. Scott died in Hollywood in 1940, having last seen Zelda a year and a half earlier. She spent her remaining years working on a second novel, which she never completed, and she painted extensively. In 1948, the hospital at which she was a patient caught fire, causing her death. Interest in the Fitzgeralds resurged shortly after her death: the couple has been the subject of popular books, movies and scholarly attention. 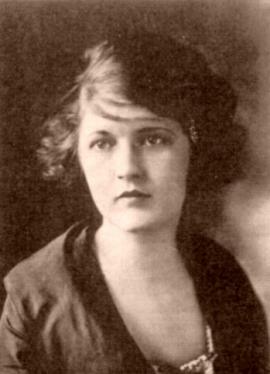 After a life as an emblem of the Jazz Age, Roaring Twenties, and Lost Generation, Zelda Fitzgerald posthumously found a new role: after a popular 1970 biography portrayed her as a victim of an overbearing husband, she became a feminist icon. Most people hew the battlements of life from compromise, erecting their impregnable keeps from judicious submissions, fabricating their philosophical drawbridges from emotional retractions and scalding marauders in the boiling oil of sour grapes.